Glen is such an amazing guitar teacher. I am honestly so grateful for all of the lessons I have had with him! Glen has always taught me in a way that I understand and if I didn’t know something, I was always comfortable to ask him to explain it in a different way. He makes lessons fun and gives you the opportunity to go busking once you have learnt 10 songs. Thank you so much Glen!! I highly recommend Glen as a guitar teacher. My son has been taught guitar lessons by Glen for two years. Glen is a great teacher for Ethan, and has always explained everything in great detail if Ethan has had problems. The goal of going busking after learning ten songs has greatly helped Ethan’s improvement and eagerness to practise and learn. If only all teachers were like Glen!! My 11 year old daughter has been taught by Glen for 4 months after learning guitar elsewhere for 8 months. In the time she has had lessons by Glen she has progressed further than what she has with her previous teacher and her enjoyment learning this instrument has grown. His enthusiasm and passion in playing the guitar is reflected in his teaching. He not only provides realistic goals for my daughter to achieve but also great incentives eg. Busking after learning 10 songs, which has motivated her to practise. Glen’s a fantastic teacher and I highly recommend him to anyone with children or want to learn guitar themselves. Thank you Glen for giving our Charlotte such an eagerness to learn the guitar (& now the ukulele too).. After 2 years of lessons, she still excitedly looks forward to her weekly lessons.. We have watched both her personal & musical confidence consistently grow under your guidance.. The busking experience you provide has also contributed to this.. Not only are you an excellent educator, but you are a brilliant person.. The passion & energy that both you & Janine give the kids is second to none.. I think that’s very clear in your students abilities & the fact they just adore you.. Thanks again for all that you are.. You guys rock!! Glen has provided private guitar lessons to numerous children at Crib Point Primary School over the past three and a half years growing from just five children to now over twenty. His growing business now embraces five other schools due to his friendly, dynamic and enjoyable approach. His lessons are based on the philosophy that if you teach children to play a whole song quickly they will remain engaged and passionate rather than plodding through endless finger exercises. This is evident in the pride and joy on the faces of the children as they participate in a lesson; perform in front of assembly or outside of the school. Glen gets wonderful results from the children who just can’t wait for their next session. My name is Jade Huber and I have been going to Glen’s lessons for about one year. Glen has been an amazing tutor; I have always felt comfortable and happy when I was there. He is always easy to understand, very funny and a great guitar player. He is very patient and always relaxed. If you ever get confused, he’s always there to help. Going to Glen’s was the best thing I have ever done. After you have learnt 10 songs, you get the chance to go busking. I can guarantee if you go, you will not forget it! Glen has taught me to “Never give up, keep on picken”. I strongly recommend Glen as a Guitar Tutor. My 11 year old son Riley has been taking guitar lessons with Glen for 12 months. The development in that time has been incredible, and given Riley a great deal of confidence, a love of music and playing guitar. As a teacher myself, I can fully appreciate and admire Glen’s incredible passion and patience. His enthusiasm and motivation is infectious, and at times I’m not quite sure who’s enjoying the lesson more, Riley, Glen or me watching them jam together. His guitar lessons are very flexible, always teaching and encouraging Riley to play the music he likes to play. He also delivers his lessons at our home, which is very convenient for us. The opportunity for all of Glen’s students to play at the annual recital is a terrific initiative, and shows how both Glen and Janine encourage and support their students to enjoy such a great experience. Riley was very fortunate to win an electric guitar in a raffle at the recital, which was a huge thrill, and now there’s no stopping him. I have no hesitation in recommending Glen and Janine at X10SIV Guitar Tuition for anyone considering taking guitar lessons. You won’t regret it. 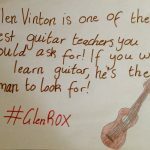 Glen Vinton of X10SIV Guitar Tuition has been teaching my son the guitar for over 3 years. Glen is an awesome teacher and mentor, who infects his students with his passion for playing the guitar. Glen has a wonderful way of engaging with his students. His lessons are fun and easy for everyone. He has a positive influence on his students and they treat him with great respect. Glen encourages his students to perform. The looks of achievement on students’ faces is ‘priceless’ after they finish performing and hear the applause of an audience. In a few short lessons, Glen has his students playing music that they enjoy, whether it be jazz, blues or something from P!nk, AC/DC or The Black Keys. His repertoire of music is “extensive”. Glen is the most funny, crazy and amazing guitar teacher. He has taught me so much songs. He makes me think that it is possible that I will become a famous guitar player in a band. I am going to miss him very much, but I hope one day we will meet again and he will be in the front row of the stage. I think he is a very good player and even though he doubts that he can sing I think he is a great singer. He is very kind for giving me hot chips at lunch and he never forgets my birthday, even though I don’t deserve it he also buys me a little present for my birthday. He always makes me happy and he can always tell a joke. As a parent I find Glen to be a fantastic music teacher as he has encouraged and progressed my daughter to a point where she can pick up the guitar and play an impressive range of songs. This is within only two years of tutoring. This would not be possible without his easy going and fun approach which instantly draws the student into feeling excited to learn new guitar technique on a weekly basis. My daughter even tries to write her own lyrics and invent her own pieces of music to all our amazement. I encourage anyone to take their child to learn guitar from Glen. He is amazing! My son has been learning guitar with Glen for 2 years now. From the first moment they sat down together it was obvious that they connected. Glen is so full of knowledge and enthusiasm for this instrument that it is contagious – Aaron just soaked it all up and still lights up whenever he picks up his guitar. Watching Aaron and Glen play together, it is hard to tell who is having more fun. The support that Glen offers is exceptional. If I have a concern about Aaron’s practising (or lack thereof), Glen is only a phone call away. The concerts that Aaron has been involved in have boosted his confidence and inspired him to keep practising. My son Seth has been having lessons with Glen since the age of 7 and he has gained the confidence to perform in two recitals. Both recitals were professional: my family and friends thoroughly enjoyed them. Glen is an exceptional teacher with the ability to bring out the best in all his students. I have witnessed my son from his early days to the competent student that he is today. Glen and Janine are caring people who do what they do for the love of music. I will always send my son to Glen for tuition as his down to earth approach is much needed to develop children’s love of music. Thank you Glen & Janine for everything you do. Arthur has been a student of Glen’s for the past three years. He has been a primary school student until now, but with his progression to secondary school this year is now a private student. We have stayed with the private lessons even though Arthur’s secondary school is going to be paying for his music lessons there. This is in no small way due to the instruction from Glen so far. Arthur was disturbed at the prospect of not continuing with Glen this year because “he makes lessons fun”. From my perspective, the lessons have been awesome! Arthur’s progress has been phenomenal. Arthur comes from a family with no musical history or training, but now has a varied repertoire of both old and new songs. Through Glen, he now has the confidence to try new tunes and to compose his own tunes as well. On a personal level, both Glen & Janine involve themselves in their pupils’ lives and get to know them as individuals. Their friendly yet highly professional manner is reflected in Arthur’s musical improvement. Glen and Janine are dedicated and passionate about their music, which is infectious and inspiring. Our 12 year old daughter Jordan and 9 year old son Kade have been learning guitar under Glen for the past 4 years and have improved dramatically. They both enjoy their music, with Jordan receiving a Music Scholarship for Secondary College late last year based on her talent with guitar. Recently we purchased a new Gibson guitar for our daughter, with Glen & Janine giving much of their time to help research, including Glen travelling to Melbourne with us to view before buying. Glen has also taken Jordan busking at a local market on a Sunday morning, purely for the experience. The guitar concerts which have been organised by Glen & Janine the past two years have been an absolute success, whilst providing entertainment for the audience and a huge confidence booster for the students. Glen and Janine are held in very high regard by our family and we recommend X10SIV Guitar Tuition to all aspiring guitarists. You won’t regret it!!!!!!!! Glen, Thanks so much for teaching both of our girls the guitar; they both love it and we really appreciate you working around our ever changing and crazy schedule. We love listening to you… the songs they learn are very cool.